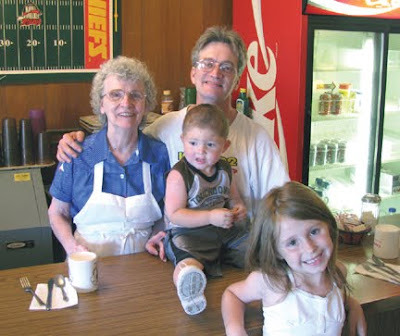 For 30 years, the family staff of Bill & Tiney’s Restaurant has served up a lot of down-home cooking. Ask the regular customers, and they’ll tell you the restaurant has also served up a lot of love. Owner Dan Holder recently made the tough decision to close the family-style restaurant, which has been a south KC landmark on Hickman Mills Drive for three decades. “We would have started our 31st year in October,” Dan said as he looked wistfully around the restaurant he’s called home for most of his adult life. Bill & Tiney’s will close its doors for good on Sunday, June 12 – if the food lasts. “It’s about saying goodbye to people who are like family to us,” Dan said. And that’s not easy, he added. Dan literally grew up in the restaurant business. His mom, Tiney, used to wait tables while she was pregnant with him. Before that, she’d been working in restaurants since she was 13, and is still going strong today, some 60 years later. “I like to say I’m 49 years old but I’ve been in the restaurant business 50 years,” Dan said. He opened Bill & Tiney’s with him mom and his dad, Bill, in 1972. They moved to the current location – a former showroom for an auto dealer – in 1979 and opened in 1980. Since that time, it’s been a second home to the Holder family. It’s also the quintessential “family business,” with everyone pitching in. There’s even a little room in the back, within view of the kitchen, where two generations of children have played while their parents worked. Bill passed away in 1996, and since then Tiney and Dan have kept it going more-or-less on their own. Dan works full-time in the grocery business as well, and he’s been putting much of what he makes back into the restaurant for too long, he said. Over time, despite a loyal family of customers, the trickling off of traffic has just been too much for the restaurant to bear, financially. But Dan is philosophical about it. “Sometimes one door has to close before another can open,” he said. As for feelings of family, Bill & Tiney’s regulars feel the same way. Julie Larimer and her son Jacob visited the restaurant last Friday to spend some time with fellow members of the Bill & Tiney’s family. Bill and Betty Hartman playfully disagreed on how long they’ve been eating at Bill & Tiney’s, but they agree that it’s one of their favorite places to go. “And we can sit here as long as we like,” Bill said with a mischievous gleam in his eye. At a corner table awash in afternoon sunlight, the Goering family – Ted, Joyce and their daughters Andrea and Erika – remembered the first time they came to the restaurant about 12 years ago. On that day, as the Goerings walked in, Tiney got the phone call that her granddaughter, Dan’s daughter Ashley, had been killed in a car accident. “We feel very close to them because of that,” Ted said. His family kept coming to the restaurant, and eventually he and Dan struck up a friendship based on their mutual interest in paranormal phenomena. Ted’s cartoon, “The Real Truth About UFOs,” hangs on the restaurant wall along with family photos and other memorabilia. Ted’s daughter Erika, now in college, said she’s been coming to the restaurant since she was little. Her mom, Joyce, said she likes the quiet, laid-back, friendly atmosphere. The Goerings, Hartmans and Larimer all said they also like Tiney’s cooking. She specializes in down-home-style vittles like biscuits and gravy, ham and beans, meatloaf, and her famous bread pudding. But don’t ask Tiney for the secret family recipes – they’re all in her head. When her friend finally made “her” chili, Tiney asked him how it was. “He said, ‘it doesn’t taste as good as yours,’” she said with pride and a touch of humor. It’s that love of both food and people that has kept Tiney coming back to cook and wait tables for six decades. “I love people, and I love to feed people,” she said. But after next Sunday, Tiney will take up a long-overdue and much-deserved retirement. “I don’t think she’ll be bored,” Dan said, gesturing at Tiney feeding her great-grandson, Dominic, while her great-granddaughter Kaydence happily munched away at her lunch. Tiney said she’ll keep busy helping Dan care for his grandchildren and just relaxing and enjoying life. But Tiney won’t stop cooking, much to the delight of her great-granddaughter. “Her french fries and omelets are really good,” Kaydence said, giving a thumbs-up sign – a compliment that put a big smile on Tiney’s face. Dan said almost everything in the restaurant except for a few keepsakes is for sale, including antique bar and stools, kitchen equipment, tables, chairs, and whatnot. As he walked through the restaurant, chatting with customers and playing with his grandkids, Dan said he’d miss it. “It’s like moving away from family,” he said. But he’s also excited about the future. He talked about a new pool he’s installing in his yard for the grandkids to swim in this summer. “We’ve got a good thing going,” he said as he looked at his family. He’s been saying that a lot lately.